Diffusing essential oils allows you control how your space feels. From creating the right mood for meditation to setting the stage for a good night’s sleep, choosing different scents for your aromatherapy oil diffuser can completely change the atmosphere of your space. Essential oils are so beneficial, there even are blends for your aromatherapy diffuser to help you workout. Not to mention how easy it is to transport your senses by using your aromatherapy oil diffuser to scent your home or office with your favorite seasonal aromas. If you’re new to essential oils or using an aromatherapy oil diffuser, the many options out there can seem endless and intimidating. To help you get started on your journey, we’ve compiled a useful list of the benefits aromatherapy oil diffusers can provide, plus how easy it is to use them. You’ll also find a great breakdown of the different types of diffusers available so you can choose the best one for your needs. Whether you’re buying your first diffuser, or ready to upgrade to a new model, finding the aromatherapy oil diffuser of your dreams has never been easier. When it comes to getting the most from your diffuser experience, it’s important to decide how you want to use it in your everyday life. Browse this list of aromatherapy oil diffuser benefits to see how diffusing essential oils can help you. This is probably the most obvious of all diffuser benefits. The whole point of using an aromatherapy oil diffuser is to disperse the aroma of essential oils throughout a space. But there’s more to essential oils than just smelling nice. With the right essential oils you can take “smelling nice” to the next level and create a memorable, luxurious ambience for you, and guests. You can create your own signature scents and use different essential oil blends in your diffuser to compliment the seasons or conjure up vivid memories of seasons past. For example, just a few drops of peppermint or cinnamon in your diffuser, and it’s easy to imagine Christmas and all the amazing memories associated with the holiday season. Or, transport your senses to a day at the beach with aromatherapy oil diffuser blends for summer. In 2007 the Natural Resources Defense Council (NRDC) published a study about toxic phthalates in common air fresheners. A whopping 12 of the 14 air fresheners tested contained phthalates which have been linked to cancer and reproductive problems. Yikes! The good news is there’s no need to rely on potentially harmful air fresheners for your home. Simply replacing those nasty sprays and wall plug units with an aromatherapy oil diffuser is all it takes. The best part is using essential oils like eucalyptus, lavender, tea tree and lemongrass can actually help clear the air by reducing airborne fungi. By swapping out synthetic air fresheners for an aromatherapy oil diffuser you’re helping to eliminate household odors, not just mask them. Experimenting with different oils in your aromatherapy oil diffuser is a fun, creative activity that many find relaxing in and of itself. Aromatherapy has even been used by nurses to lower anxiety levels and improve sleep quality in ICU patients. Keeping a stash of the most relaxing oils on hand to use in your aromatherapy oil diffuser is a great way to stay prepared to deal with everyday stress. Lavender oil is one of the most popular oils to diffuse when setting the mood for bedtime. Peppermint oil, sweet orange, patchouli and rosemary are also useful for creating a calm, peaceful space. By now, you can see that an aromatherapy oil diffuser does more than simply fill your home or workplace with incredible scents. In fact, modern research has revealed that essential oils may activate certain parts of your brain connected to emotions. To avid aromatherapy practitioners, this comes as no surprise. Soothing essential oils like frankincense and patchouli have a rich tradition of use in emotional healing and spirituality. While bright citrus essential oils are often associated with happiness, joy and creativity. With the right essential oils, you can go beyond using your aromatherapy oil diffuser to just boost your mood. Diffusing essential oils can make a great addition to your self-care routine and managing minor issues. Not only can you find emotional solace with soothing essential oils like frankincense, but you may also find aromatherapy useful when dealing with physical discomfort as well. In fact, aromatherapy is often used as a form of complementary therapy when dealing with cancer and other illnesses. Using an aromatherapy oil diffuser for peppermint oil inhalation has been used to calm nausea in postoperative patients. Diffusing essential oils have also shown promise as tools to help you feel more comfortable while dealing with pain. Eucalyptus, peppermint, tea tree and rosemary can also bring comfort during cold and flu season. Adding one or more of these to your aromatherapy oil diffuser can help your sinuses feel more comfortable when you’re under the weather. Essential oils and aromatherapy have a deep connection with spirituality and meditation. 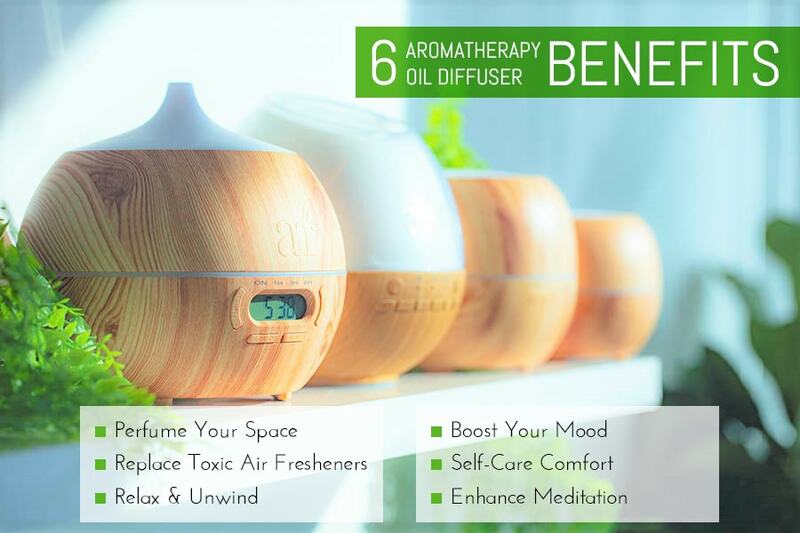 Using the right essential oils in your aromatherapy oil diffuser allows you to create a space that invites and encourages a mind-body connection. Quiet an anxious mind with calming essential oils like lavender, frankincense, and patchouli. Encourage positivity with sweet orange or peppermint. Help yourself become more mindful by using pine needle, rosemary and eucalyptus in your aromatherapy oil diffuser. Using an aromatherapy oil diffuser is as easy as 1, 2, 3. Although specific instructions may vary between specific diffusers and different brands, the general gist of it is pretty universal. Step 1: First remove the cover to the water tank on your diffuser. Next, locate the waterline on your diffuser. Fill this component of your diffuser with the appropriate amount of water. Step 2: Add around 15-20 drops of essential oils to the water. This amount may vary depending on the size of the diffuser, feel free to experiment with more or less drops as you figure out what kind of scents you enjoy. You can even experiment by adding more than one type of oil to the diffuser. If you need inspiration try one of our seasonal blends in your aromatherapy oil diffuser. Step 3: Place the cover back on your diffuser again. Press the “mist” button to begin diffusing. Certain diffusers may have the option to adjust the misting time from 1 hour, 2 hours, 6 hours, etc. It’s just that easy! Whenever you want to change up aromas, simply empty the tank and start with clean water. Keep your machine in tip top working order with our easy step-by-step guide to cleaning your aromatherapy oil diffuser. When shopping for the perfect aromatherapy oil diffuser, there are several features that can make or break your experience. These are some the most important diffuser features to consider. In the dark ages of aromatherapy, oil diffusers required a heat source to disperse their beneficial aromas, sometimes even an open flame. While the dancing flicker of an open flame may be nice to look at, oil diffusers that require a heat source are not always practical or safe. 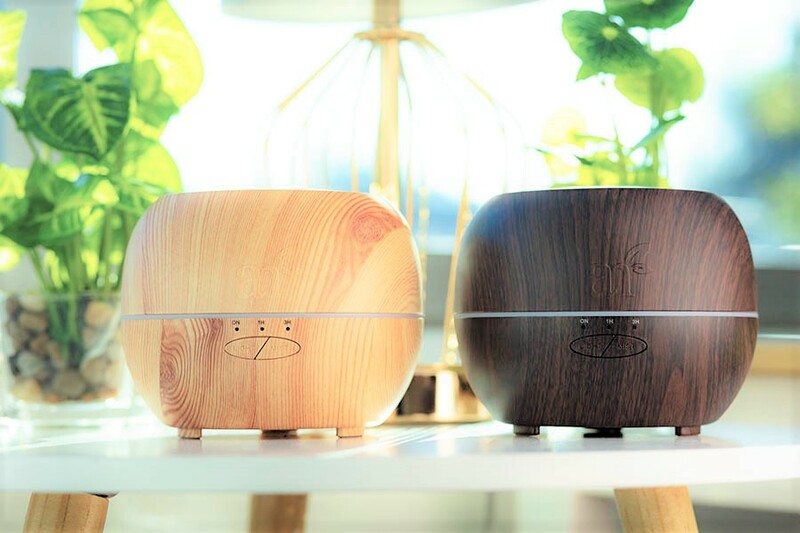 Today, the best aromatherapy oil diffusers use ultrasonic technology to disperse essential oil vapors. These types of cool mist diffusers are much safer to use for diffusing essential oils to help you sleep. Just as you should never leave a candle burning while you sleep, oil diffusers that require heat sources should never be left unattended. While no one misses the fire hazard of an open flame oil diffuser, the gentle lighting could be very soothing. Modern aromatherapy oil diffusers often have soothing light features to provide a gentle glow without the danger of open flames. Look for LED lights so you don’t have to worry about bulbs wearing out. One of the most common misconceptions about aromatherapy oil diffusers is that bigger rooms require diffusers with bigger water tanks. The size of the water tank simply determines how long an oil diffuser can run without being refilled. Even aromatherapy oil diffusers with smaller water tanks can generally run for anywhere between 4 and 6 hours. Timer settings are really useful so you have more control over how long your diffuser is left running. If you use your oil diffuser primarily in the bedroom, an alarm clock is a pretty convenient feature. An oil diffuser with a built-in alarm clock allows you to cut down on bedside gadgets for a less cluttered look and reduced energy use. Incorporating music and ambient sounds into your aromatherapy practice are a great way to enhance the atmosphere of your space. 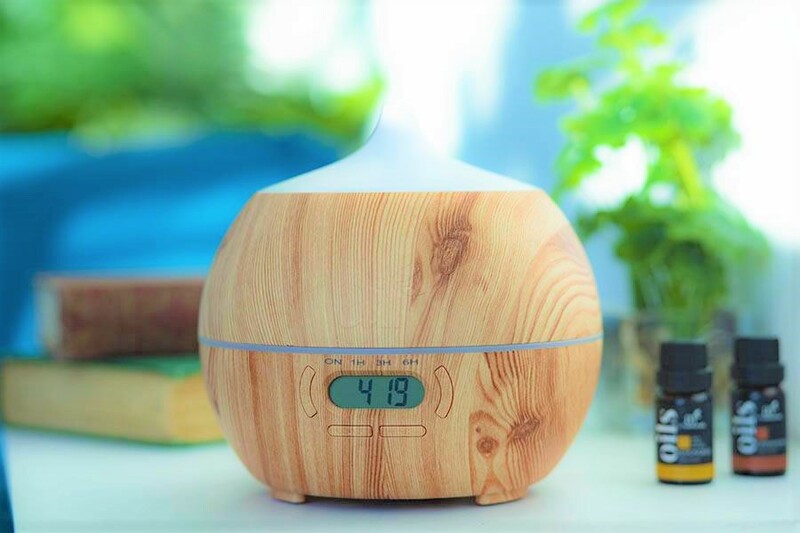 Some oil diffusers come with built in white noise or sounds of nature that can help you relax and sleep more peacefully. Others take it to the next level by allowing you choose your own music via Bluetooth technology. Bluetooth diffusers are especially wonderful to use for yoga, pilates, and other types of mind-body activities. So now that you’ve become more acquainted with the benefits of using an aromatherapy oil diffuser and the different features to look out for, it’s time to get your shop on. 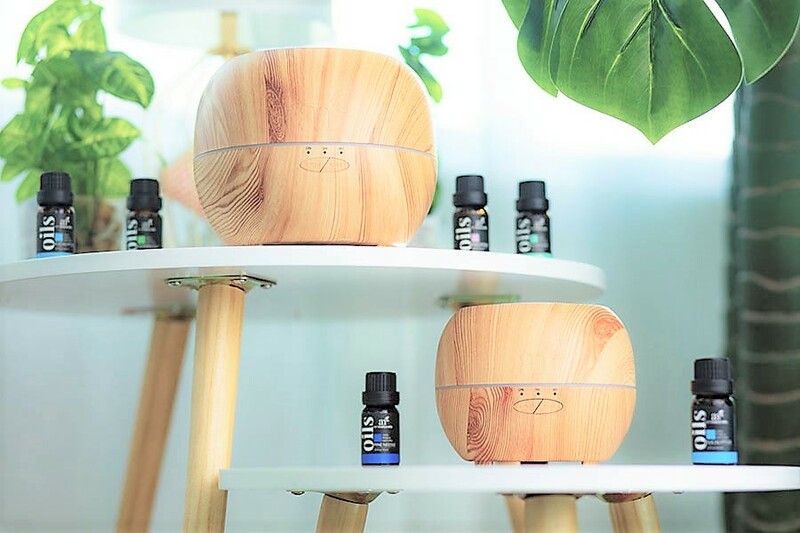 Choosing the best diffuser for your needs (or the perfect diffuser to give a loved one) doesn’t have to be a hassle, there’s a diffuser for everyone! Guest bedrooms, bathrooms, and home offices are all areas an aromatherapy oil diffuser can really elevate. The only problem is that those are the household areas that tend to be low on extra space. Not to worry, when you’re short on space, but you still want a luxury feel, a smaller diffuser is just the thing. When you’re dealing with top of the line cool mist diffusers, size truly doesn’t matter when it comes to performance. Opting for a smaller aromatherapy oil diffuser, simply means a smaller water tank. Even diffusers with tanks as small as 150 milliliters can still run between 4 and 6 hours without refilling the water. We all know them (or maybe we are them)... the person who never diffuses the same essential oils two days in a row. Experimenting with different blends in your aromatherapy oil diffuser is half the fun! Oil diffusers with smaller water tanks aren’t just a great way to conserve space, they’re also perfect for the essential oil experimentalist in your life! No need to fill a huge water tank if you know you’re just going to toss out the water to diffuse a new blend the next day. If your essential oil motto is more #alldayeveryday, than just once in awhile, you need an oil diffuser that can keep up with you! Choosing an aromatherapy oil diffuser with a larger water tank allows you to go longer without refilling the water. Diffusers with larger tanks are also a great option for communal areas like kitchens and living rooms. For example, an aromatherapy oil diffuser with a 400 milliliter tank can run anywhere between 6 and 9 hours without refilling. That’s enough for a whole day’s worth of family gathering. For that tech-savvy gadget lover on your list, nothing beats a Bluetooth compatible diffuser. Bluetooth enhanced oil diffusers allow you to stream your favorite music right from your phone!. You can even listen to audiobooks and podcasts while you diffuse. Bluetooth capable aromatherapy oil diffusers are essential for diffusing during meditation, yoga and other mindful body exercises. You can play anything from soothing sounds of nature and your favorite workout playlist to guided meditations. If peaceful sleep is your main priority, consider an aromatherapy oil diffuser that is designed with better slumber in mind. The ideal diffuser for a bedroom should help you relax and offer easy-to-use features. Whether you’re a new parent with a fussy baby, or a just have trouble winding down an oil diffuser sound machine combo may be just what you need. Aromatherapy oil diffusers with built-in relaxing sounds of nature and white noise are key for helping quiet a busy mind so you can head off to dreamland. A white noise feature can be especially helpful if you live in a noisy city or neighborhood. Now you know the benefits of using an aromatherapy diffuser, and what kind of features to keep an eye out for while shopping. Whether you’re new to diffusing or picking out a diffuser to gift your bestie, you’re well-equipped to pick out the best aromatherapy oil diffuser for your needs. Now all that’s left is to perfect your diffuser blends! Check out our DIY section for tons of aromatherapy oil diffuser blends for every season and mood. Got questions? Send them to us in the comments or via email. We’re happy to talk everything diffusers and essential oils any time!